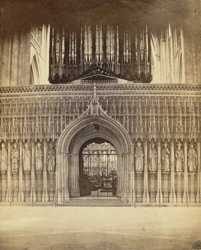 "Separating the choir from the nave is the Stone Screen, a very prominent and important feature, as, from the main western entrance, the eye is almost immediately rests upon it. This one may be justly admired fro its beautifully delicate and florid sculpture. The front is divided into fifteen niches, containing the statues of the Kings of England from William the Conqueror to Henry VI."